The red and white striped building to the left is the Green Point Lighthouse. The bottom right corner of photo is the approximate position of the wreck. 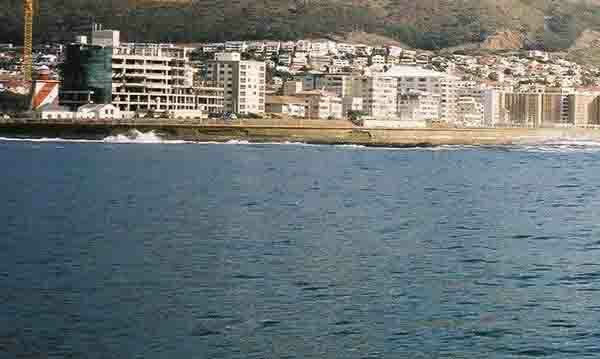 Cape Town has many shipwrecks along its coastline. The shipwreck that we are writing about is one of the more modern wrecks that happened in Cape Town where the ship was wrecked and there was no loss of life. The SS South African Seafarer ran aground in a terrible winter storm about 50 metres off the Green Point Lighthouse on the 1st of July 1966. It's the middle of winter here in South Africa and the time for some of the severest north easterly storms to hit our coastline. 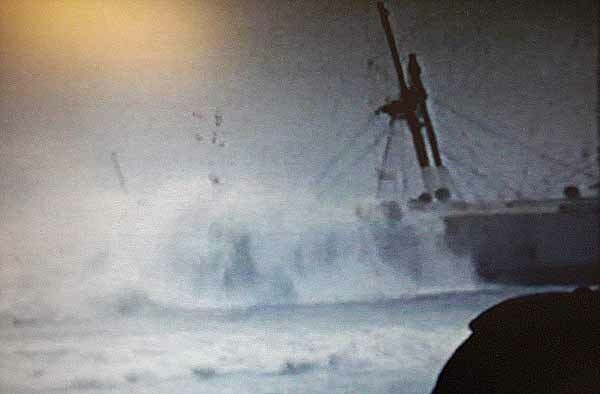 On this particular day the Seafarer was caught in a storm and she was too close to the coastline and paid the penalty for her error in judgement. The wind and waves forced it ashore and it landed up on the rocks with mountainous waves breaking over it. 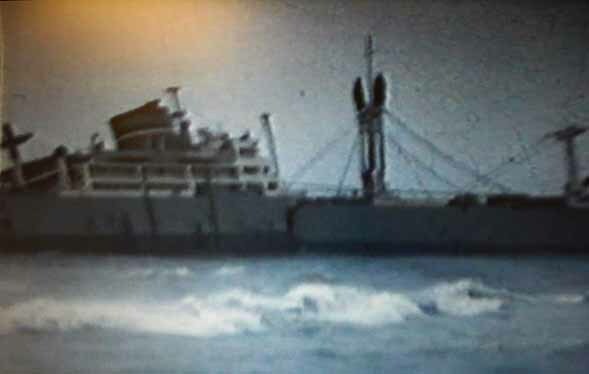 On board were 63 crew members and 12 passengers who had no hope of survival due to the heavy seas. So near! Yet so far! The view of the shoreline that the survivors saw as they waited for the helicopter rescue. The sea was a lot rougher than this though! The South African Air Force were requested to help in the emergency and sent out a couple of Alouette helicopters to assist in the rescue. The pilots managed to rescue everybody on board and land them safely on the lawns in front of the Green Point Lighthouse. It was a miracle that nobody lost their lives that day as the strong winds made life very difficult for the pilots to hover above the stricken ship and lift the people off. The pilots involved in the rescue were awarded medals for bravery. Seafarer in the waves before breaking up. Photos donated by Mark Knight. With the continual pounding of the waves the ship soon broke up and sank leaving its cargo to the mercy of the sea. What's left of the cargo is now spread around the wreck site. On board the Seafarer was a consignment of miniature white plastic horses. They were about thumbnail size. When the ship broke up they were released into the sea and washed up along the Table Bay coastline. I remember walking along the beach and picking up hundreds of them.They were put to many uses by the locals and many ended up on the edges of cotton doilies after having the oil boiled off them. Today, 38 years later the remains of the wreck of the Seafarer still lie strewn on the sea bed about 50 metres off the lighthouse. The sea bed resembles a junkyard, with the huge propeller shaft and countless unidentifiable machine parts lying around. Shortly after the wrecking of the ship all non ferrous fittings were removed from the wreck site. Most divers want to see a ship lying on the bottom but are disappointed when visiting the Seafarer. There is nothing ship shape at the site. Because of this not many divers visit the site and this means that there is still a lot of exploring to be done. There could still be some interesting artefacts lying on the sea bottom for divers to find. For those who might be interested in diving the site, the ship lies in water which is about 5 metres deep about 50 metres off the coast. 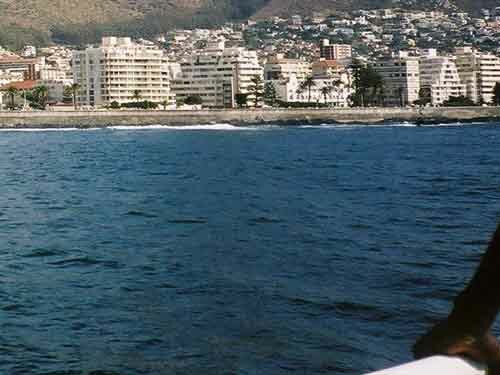 To reach the wreck one needs to go to the site by boat from Three Anchor Bay or from the V & A Waterfront. I'm sure that using a little ingenuity a determined diver could swim to the site from the beach. Unfortunately, this is one place you won't find me, but you are welcome to come and explore.